Bionomic Industries, Inc., a leading manufacturer of scrubbing equipment and "prepackaged" scrubber systems, has announced availability of a breakthrough, compact, self-contained scrubber system concept that offers extremely high performance, minimal field labor to install, and dramatically reduced erection time and related costs. Available in two configurations and sizes to handle gas streams from 500 to 25,000 cfm, the ProClean Type CT System removes water soluble gaseous contaminants at efficiencies needed to meet the most stringent EPA and state pollution control requirements. 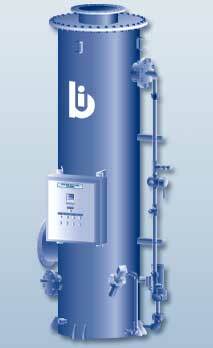 The system incorporates Bionomic’s field-proven Series 5000 Packed Tower Scrubber with other integrated components – recirculation pump, required piping, instrumentation and controls – specifically engineered for high reliability, low maintenance and extended service life. All surfaces in contact with gas and liquid feature corrosion-resistant materials, and the standard scrubber vessel is fiberglass composite construction utilizing a premium grade vinyl ester resin system exceeding the latest industry standards for unmatched quality and integrity. All systems are run tested and debugged at the factory to eliminate lengthy start-up procedures to facilitate critical installation schedules.